Copyright: © 2014 Ashok Kumar. This is an open-access article distributed under the terms of the Creative Commons Attribution License, which permits unrestricted use, distribution, and reproduction in any medium, provided the original author and source are credited. Porphyromonas gingivalis is an anerobic, gram negative, bacterium which is a natural inhabitant of oral microbiome. Under unhealthy oral hygiene conditions the bacterium becomes highly destructive (photobiont) and leads to periodontitis (inflammation of periodontium). Several drugs like chlorhexidine, monocycline effectively reduce the viability of biofilms formed by Porphyromonas gingivalis but, it is impossible to destroy biofilms completely. As the bacterium evolves continuously it develops drug resistance due to events like horizontal gene transfer and its biofilm mode of living. Therefore no drug is very efficient in treating Periodontitis. We have done an Insilco Synteny based comparative analysis to find a druggable target which remains unchanged in various Porphyromonas gingivalis strains. Dipeptidylaminopeptidase has been identified one such potential target which is responsible for virulence in Porphyromonas gingivalis, and is functionally and structurally conserved. Therefore, according to best knowledge of authors a drug developed against this target will be effective in treating periodontitis caused by all evolved forms of bacterium. Periodontitis is inflammatory diseases caused by peridontopathic bacteria, majorly acquires gingival crevice, often causing gums to shrink and loosening of teeth. It is apparently caused by specific gram negative anaerobic bacteria , Porphyromonas gingivalis, Treponema denticola, and Tannerella (formerly Bacteroides) forsythia more commonly termed as the ''red complex''[2,3]. Porphyromonas gingivalis is a natural member of more than 500 bacterial species that live in oral microbiome, yet it becomes immensely catastrophic (termed pathobiont) and proliferates to high cell numbers in periodontal lesions: this is credited to its arsenal of specialized virulence factors. Gingival epithelial cells, the outer lining of the gingival mucosa, which function as an innate part of the innate immune system, are among the first host cells colonized by Porphyromonas gingivalis . Treponema denticola leads to necrotizing ulcerative gingivitis after getting adhered to fibroblasts, epithelial cells, as well as to extracellular matrix components present in periodontal tissues. It posses outer-sheath-associated peptidases, chymotrypsin-like and trypsin-like proteinases, hemolytic and hemagglutinating activities, adhesins as virulence factors which aid in early periodontitis . T.forsythia is another anaerobic, Gram-negative bacterium isolated from the gingival sulci and periodontal pockets of patients with periodontitis . Several T.forsythia virulence factors have been identified , including, trypsin-like  and PrtH proteases , sialidases SiaH  and NanH , a leucine-rich repeat cell-surface-associated and secreted protein BspA , an apoptosis-inducing activity , alpha-D-glucosidase and N-acetyl-beta-glucosaminidase , a hemagglutinin , components of the bacterial S-layer . Within group of red complex, P. gingivalis and T. denticola are frequently found together in diseased sites , but T. forsythia, may not co localize spatially with them [16,17]. Also T. denticola do not form homotypic biofilms. It is P. gingivalis which acted as an initial colonizer of the substratum, enabling subsequent incorporation of T. denticola [18,19]. Gingipains (P. gingivalis) and dentilisin (T. denticola) have happened to be involved in the co aggregation [19,20]. Due to the fastidious growth requirement for culturing T. forsythia and the genetic manipulations of this organism are difficult to perform, this organisms is understudied .Among the species of red complex, P. gingivalis has happened to be a major pathogen, with well-defined virulence factors including cell surface located proteolytic enzymes and adhesins (gingipains) [22,23]. Recent studies have focused on the pathogenic traits of the Porphyromonas gingivalis. A pioneering work by scientist suggests that Porphyromonas gingivalis produces an array of potential virulence factors viz capsule, outer membrane protein and gingipains etc. It possesses strong proteolytic activity, which is considered to be associated with tissue destruction. It cleaves epithelial junction proteins, which suggests that it invades deep into tissue via paracellular pathway and thereby destroying the connective tissue. Identified proteases are Arg-specific and Lys-specific cysteine proteases, DPPIV , prolyltripeptidyl peptidase (PtpA), and others . There are several ways of treating periodontitis, non-surgical methods like (scaling and root planning), surgical methods (flap surgery, bone and tissue grafts) medication is used with non-surgical treatment but, it has been seen that Porphyromonas gingivalis biofilms persist even after treatment with chlorhexidine (chlorinated phenolic disinfectant used commonly in mouthwash for its action against bacteria)  and other known antibiotics also. The bacterium continuously evolves since the biofilm it forms with other bacteria provides an ideal niche for the exchange of extrachromosomal DNA which encodes for resistance to antimicrobial agents and therefore making it difficult to treat bacteria . It is known that certain residues that perform key functional and structural roles tend to be preserved by natural selection. In this regard discovering genome level similarity based on modern approach like Synteny Based Comparative Genomics is serving us to find precisely the essential genes which are conserved and play a role in intensification of bacterial infection as well as in promoting drug resistance in case of periodontitis and therefore, can be potential drug targets. 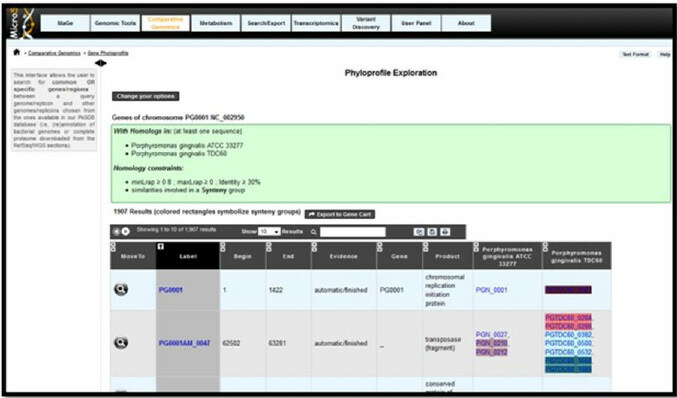 NCBI Genome was used for genome selection of Porphyromonas gingivalis. Only the genomes that were completely sequenced (Porphyromonas gingivalis ATCC 33277 and Porphyromonas gingivalis TDC60) were selected for carrying comparative genome analysis. According to literature and database availability of complete genome information, we opted for Porphyromonas gingivalis W83 as a reference genome. Microscope server (www.genoscope.cns.fr/agc/microscope/home)  was used to carry out the synteny analysis between the three fully sequenced genomes of Porphyromonas gingivalis. Firstly the reference genome was selected and loaded into the browser and then the other two strains (Porphyromonas gingivalis ATCC 33277 and Porphyromonas gingivalis TDC60) were selected. Homologous synteny blocks were identified based on Microscope search. The list of the conserved synteny blocks was downloaded in the form of MS-Excel data. From the synteny data obtained, variable and non- variable genes was filtered based on the observation that a particular gene from the comparable genomes corresponded to only a single gene in the reference genome also, such genes were taken under non- variable genes and the conserved blocks that corresponded to more than one gene in the compared genomes were kept under variable genes. Then, a literature study was performed using PubMed to determine the major virulent factors present in Porphyromonas gingivalis. These genes was then searched in non-variable genes and a list of virulent factors were made and each of which was individually studied to find a factor or a potential target that was conserved in all the strains and had role in increasing the pathogenic potential of Porphyromonas gingivalis. Insilico characterization of target was done by retrieving the nucleotide and amino acid sequences from NCBI. MSA using MUSCLE  was done for protein as well as nucleotide sequences. The selected target was validated performing a database search using BLAST  to see whether the target was specific to the bacterium or it was homologous to some human protein. After BLAST results, conserved domains were predicted using InterPro  to see structurally and functionally similar domains in the target sequences from three different strains of Porphyromonas gingivalis. Only the completely sequenced genomes of Porphyromonas gingivalis were selected. Porphyromonas gingivalis W83 was taken as a reference genome and was compared with the other two completely sequenced genomes of Porphyromonas gingivalis ATCC 33277, and Porphyromonas gingivalis TDC60. Results from Microscope server showed conserved synteny blocks between the reference and other two strains. Colored boxes in the results represent synteny conservations in at least one organism of the related taxon (Figure 1). Literature studies suggested that peptidases in Porphyromonas gingivalis were the major reason for its virulence and therefore from the list of non-variable genes (Table 1), another list of all the peptidases was made and analyzed further and out of which DPP IV was selected as a potential target (Table 2). Nucleotide sequences of the three DPP IV genes from three different strains were analyzed by performing MSA by MUSCLE. The percent identity matrix has identity of 61% between the sequences and hence was found to be homologous to each other. Percent identity matrix of amino acid sequences revealed identity of more than 30% hence was homologous. Amino acid sequences retrieved from NCBI had shown that the amino acid number varied from first sequenced to recently sequenced strains Porphyromonas gingivalis W83 had 732 amino acids , Porphyromonas gingivalis ATCC 33277 had 723 amino acids  and Porphyromonas gingivalis TDC60 had 709 amino acids , respectively. This variation in amino acid numbers could be due to evolution of bacterium and would have led to some loss or gain in function. In order to make sure that Porphyromonas gingivalis DPP IV is specific and is not found in humans, BLAST database search was conducted against non- redundant protein database and results gave no significant similarity with any human protein for three DPP IV sequences. Therefore we conclude that the target selected was specific to Porphyromonas gingivalis. InterPro gave the two common conserved domains for three DPP IV sequences. IPR029058 (a region in DPP IV predicted as Alpha/Beta hydrolase fold; this structure is common to a number of hydrolytic enzymes of widely differing phyologenetic origin) and IPR002469 [a region in DPP IV as belonging to serine peptidase family (S9)]. This led us to believe that even though the sequence is changing, functionally and structurally important regions are still conserved. Therefore, a drug made against this target will remain effective for all Porphyromonas gingivalis strains and since DPP IV is highly conserved it will not show resistance to the drug. Secondary structures was predicted using PHD  showed that number of alpha helices was increasing in newly sequenced bacteria hence making DPPIV a more stable structure (Table 3). Tertiary structures were generated using SWISS MODEL and were then visualized in Chimera, all the three DPP IV structures predicted were found to be homodimers. Verify3D  validated structures generated by SWISS MODEL, all structures obtained profile scored greater than 0.2. The structure was also validated by generating Ramachandran plots of the three models and by calculating RMSD values  for the superimposed structures in chimera (Table 4). Maximum residues in Ramachandran plot lied in allowed regions and RMSDs obtained using both Smith Waterman and Needleman Wunch algorithm were less than 2 angstrom. The current study illustrates an emerging field of comparative genomics i.e. synteny based analysis which allows us unmask the conserved gene content and gene order. Identifying Synteny blocks and aligning whole genome both rely on markers across the genomes long enough to make their conservation statistically significant . Till date many conventional therapies have been used in treating periodontitis but eventually fail due its complex multi-factorial etiology . Therapies include mechanical removal of bacterial deposits and calculus from subgingival environment or performing rooting and scaling followed by use of antibacterial agents mainly chlorhexidine, tetracycline, doxycycline and minocycline but local delivery is cost effective. They bind to tooth and reduce bacterial count and dental plaque, out of which chlorhexidine is a gold standard in dentistry [40,41]. Since P.gingivalis colonizes first to the tooth surface followed by synergy association with T. denticola in establishing biofilms and with T.forsythia, it is assumed that if a target is chosen from P.gingivalis it will strongly effect the association which the organisms have with other two anaerobes. According to the literature, many protease targets have been reported which accounts for strong proteolytic activity due to which P. gingivalis invade into deeper tissues . With the aid of synteny based study, we are able to deduce one such potential druggable target i.e. DPP1V protease which is involved majorly in pathogenesis of bacterium. This target is species specific and structurally and functionally conserved in all the known three strains of P. gingivalis. To wrap up if drug is made against this target of P. gingivalis which happened to be primary colonizer, it would staunch enough treat to periodontitis effectively. Synteny based analysis of P. gingivalis has led to testimony of diverse proteases that can be used for potential target for drug design. As various proteases have been noted to play a substantial role in pathogenesis of periodontitis, a systematic approach to develop drug will be propitious for treatment. In this study DPP1V has found to play a decisive role in breaching deeper tissues and biofilm formation which happens to be an imperative factor in periodontitis. It is expected that if drug is developed against this will be roseate in cure. 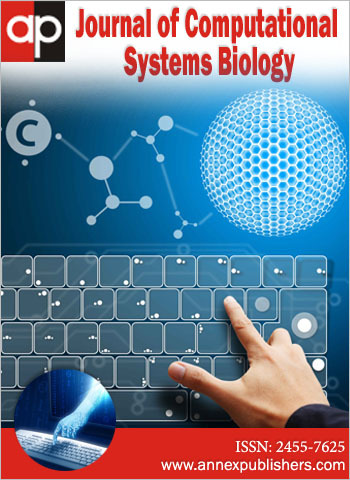 Authors are thankful to Vice Chancellor of Panjab University, Chandigarh, and Coordinator of Centre for Systems biology and Bioinformatics for providing all the facilities to carry out the present work. We acknowledge the free softwares, tools and web servers used in this present study (NCBI genome, Microscope server, MUSCLE, BLAST, InterPro, SWISS model, PHD, Chimera). 1Malemud CJ (2011) Molecular mechanisms in rheumatic diseases- Rationale for novel drug development: Introduction. Anti-Inflammatory Anti-Allergy Agents Med Chem 10: 73-7. 2 Wisler BA, Dennis JE, Malemud CJ (2011) New organ-specific pharmacological strategies interfering with signaling pathways in inflammatory disorders/autoimmune disorders. Curr Signal Transduct Ther 6: 279-91. 3 Malemud CJ, Blumenthal DE (2014) Protein kinase small molecule inhibitors for rheumatoid arthritis: Medicinal chemistry/Clinical perspectives. World J Orthop 5: 496-503. 4Malemud CJ, Reddy SK (2008) Targeting cytokines, chemokines and adhesion molecules in rheumatoid arthritis. Curr Rheum Rev 4: 219-34. 5Choy EH, Panayi GS (2001) Cytokine pathways and joint inflammation in rheumatoid arthritis. N Engl J Med 344: 907-16. 6 Wylie MA, Malemud CJ (2013) Perspective: Deregulation of apoptosis in arthritis by altered signal transduction. Int J Clin Rheumatol 8: 483-90. 7 Malemud CJ (2011) Dysfunctional immune-mediated inflammation in rheumatoid arthritis dictates that development of anti-rheumatic disease drugs target multiple intracellular signaling pathways. Anti-Inflammatory Anti-Allergy Agents Med Chem 10: 78-84. 8 Lewis AC, Malemud CJ (2011) Correction of dysfunctional apoptosis in arthritis by pharmacologic interventions: Focus on altering the activity of inhibitor of apoptosis protein, Recent Research Developments in Pharmacology. SG Pandalai, Research Signpost: Kerala, INDIA, 69-84. 9 Malemud CJ, Haque A, Louis NA, Wang J (2012) Immune response and apoptosis- Introduction. J Clin Cell Immunol S3: e001. 10 Ivashkiv LB, Hu X (2004) Signaling by STATs. Arthritis Res Ther 6: 159-68. 11 Malemud CJ (2007) MAP kinases, OA, Inflammation and Degradation: A Continuum. J Buckwalter, M Lotz, J-F Stoltz, Biomedical and Health Research, Amsterdam, IOS Press 70: 99-117. 12 Malemud CJ, Pearlman E (2009) Targeting JAK/STAT signaling pathway in inflammatory diseases. Curr Signal Transduct Ther 4: 201-21. 13 Opferman JT, Letai A, Beard C, Sorcinelli MD, Ong CC, et al. (2003) Development and maintenance of B and T lymphocytes requires antiapoptotic MCL-1. Nature 426: 671-6. 14Starr TK, Jameson SC, Hogquist KA (2003) Positive and negative selection of T cells. Annu Rev Immunol 21: 139-76. 15 Liu YJ (2001) Dendritic cell subsets and lineages, and their functions in innate and adaptive immunity. Cell 106: 259-62. 16 Hutcheson J, Perlman H (2008) Apoptotic regulators and RA. Curr Rheum Rev 4: 254-8. 17 Chen Z, Yue SX, Zhou G, Greenfield EM, Murakami S (2015) ERK1 and ERK2 regulate chondrocyte terminal differentiation during endochondral bone formation. J Bone Miner Res 30: 765-74. 18 Heinrich PC, Behrmann I, Haan S, Hermanns HM, Müller-Newen G, et al. (2003) Principles of interleukin-(IL)-6-type cytokine signaling and its regulation. Biochem J 374: 1-20. 19Gómez R, Conde J, Scotece M, Gómez-Reino JJ, Lago F, et al. (2011) What's new in our understanding of the role of adipokines in rheumatic diseases. Nat Rev Rheumatol 7: 528-36. 20 Malemud CJ, Schulte ME (2008) Is there a final common pathway for arthritis? Future Rheumatol 3: 253-68. 21 Malemud CJ (2004) Protein kinases in chondrocyte signaling and osteoarthritis. Clin Orthop Relat Res 427: S145-51. 22Goldring MB (2004) Culture of immortalized chondrocytes and their use as models for chondrocyte function. Methods Mol Med 100: 37-52. 23 Finger F, Schörle C, Zien A, Gebhard P, Goldring MB, et al. (2003) Molecular phenotyping of human chondrocyte cell lines T/C28a2, T/C28a4 and C-28/I2. Arthritis Rheum 48: 3395-403. 24 Malemud CJ, Sun Y, Pearlman E, Ginley NM, Awadallah A, et al. (2012) Monosodium urate and tumor necrosis factor-α increase apoptosis in human chondrocyte cultures. Rheumatology (Sunnyvale) 2: 113. 25 Islam S, Kermode T, Sultana D, Moskowitz RW, Mukhtar H, et al. (2001) Expression profile of protein tyrosine kinase genes in human osteoarthritis chondrocytes. Osteoarthritis Cartilage 9: 684-93. 26 Singh R, Ahmed S, Malemud CJ, Goldberg VM, Haqqi TM (2003) Epigallocatechin-3-gallate selectively inhibits interleukin-1β-induced activation of mitogen activated protein kinase subgroup c-Jun-N-terminal kinase in human osteoarthritis chondrocytes. J Orthop Res 21: 102-9. 27 Zing Z, Cardona CJ, Anunciacion J, Adams S, Dao N (2010) Roles of the ERK MAPK in the regulation of proinflammatory and apoptotic responses in chicken macrophages infected with H9N2 avian influenza virus. J Gen Virol 91: 343-51. 28 Wanniger J, Neumeier M, Weigert J, Bauer S, Weiss T, et al. (2009) Adiponectin-stimulated CXCL8 release in primary human hepatocytes is regulated by ERK1/ERK2, p38 MAPK, NF-kappaB, and STAT3 signaling pathways. Am J Physiol Gastrointest Liver Physiol 297: G611-8. 29 Wijesekara N, Krishnamurthy M, Bhattacharjee A, Suhail A, Sweeney G, et al. (2010) Adiponectin-induced ERK and Akt phosphorylation protects against pancreatic beta cell apoptosis and increases insulin gene expression and secretion. J Biol Chem 285: 33623-31. 30 Rossi A, Lord JM (2013) Adiponectin inhibits neutrophil apoptosis via activation of AMP kinase, PKB and ERK1/2 MAPK. Apoptosis 18: 1469-80. 31 Gandhi H, Upaganlawar A, Balaraman R (2010) Adipocytokines: The pied pipers. J Pharmacol Pharmacother 1: 9-17. 32Aida Y, Honda K, Tanigawa S, Nakayama G, Matsumura H, et al. (2012) IL-6 and soluble IL-6 receptor stimulate production of MMPs and their inhibitors via JAK- STAT and ERK-MAPK signaling in human chondrocytes. Cell Biol Int 36: 367-76. 33 Cheon H, Yang J, Stark GR (2011) The functions of signal transducers and activators of transcriptions 1 and 3 as cytokine-inducible proteins. J Interferon Cytokine Res 31: 33-40. A list of non variables genes was obtained. Increase in the number of alpha helices and decrease in the number of, extended strands and random coils are seen.